Remove the fat around the bottom of the breasts if there is any. Wash the chicken breasts and pat them dry using paper towels. Make 3-4 deep diagonal incisions into the flesh of each piece using a sharp boning knife. Strain out the excess whey of the yogurt using a cheese cloth for about 15 minutes. 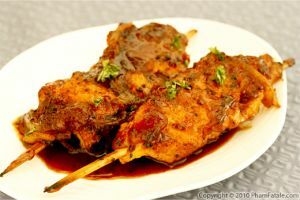 Add all ingredients of the marinade (ginger garlic paste, 1 teaspoon red chili powder, the juice of 1 lemon, papaya paste, garam masala spice mix and oil) and mix together with the yogurt. Season the chicken with salt, ½ teaspoon chili powder and black pepper. Rub evenly. Place the chicken in a large bowl or a sealable zip-top bag. Spread the yogurt mixture over the chicken. Make sure the tandoori marinade penetrates and coats the chicken. Marinate in the refrigerator overnight. Remove the chicken 15 minutes before cooking to bring it back to room temperature. Reserve the marinade on the side. Pat dry the chicken using paper towels. Brush the hot barbecue grill with oil using a brush. Place the chicken on the grill and cook for 8-10 minutes over medium heat. 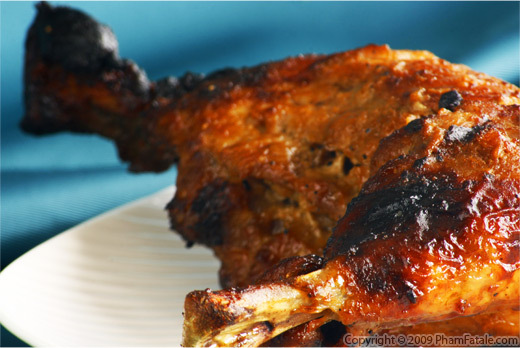 Baste the meat every now and then with the reserved tandoori marinade. 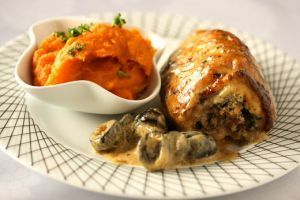 Flip the chicken breasts and cook for an additional 7-8 minutes, brushing the chicken one more time with the remaining marinade. Remove the chicken from the grill. Drizzle with the remaining lemon juice and loosely cover with foil. Allow to rest for at least 10 minutes. A thermometer should register 165°F in the thickest part of the piece of chicken. The chicken should have a dry crust on the outside and be very moist on the inside. 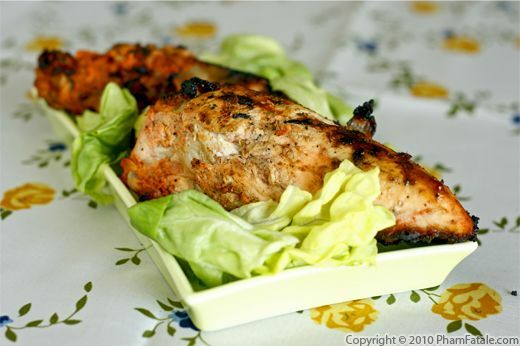 Serve the tandoori chicken on a bed of lettuce with basmati rice and raita (Indian style yogurt) on the side. 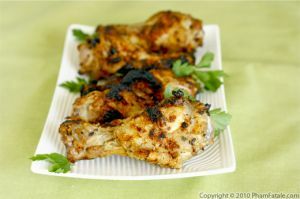 If you don't want to grill the chicken on the barbecue, you could also bake the tandoori chicken in the oven. I use green papaya, yogurt and lemon juice as meat tenderizers to ensure juicy and moist meat.. 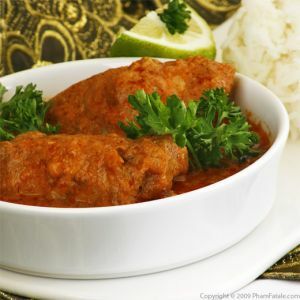 The papaya paste was Baji, Lulu's late grandma's secret for tender and moist meat. Peel a green papaya. Grind the cubed papaya with seeds in a mini food processor; place about 2 teaspoons of papaya paste per slot in an ice-cube tray and freeze them. Transfer the ice-cubes into sealable plastic bags and place back in the freezer. I think it's the best way to keep the flavor without getting freezer burn. I store them exactly the same as I would extra pesto. Published By: Jacqueline Pham on August 12, 2010.